Welcome to Garden Blogger's Bloom Day for December 2012. Here in my zone 6a garden in central Indiana, we have not yet had any snow so it still seems more like late fall than winter. I looked back at previous bloom day posts and remembered that last year in December, I only had one bloom to show. This year I have three types of blooms, mostly because we have had fairly mild weather so far this season. 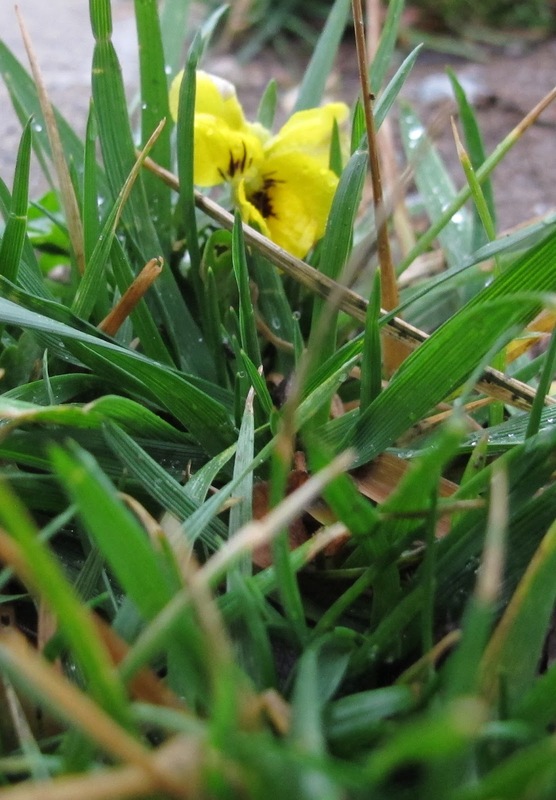 Out in the lawn there are a couple of violas that have established themselves and still have a few blooms on them. I leave them be and hope that they will make it through the winter to bloom again in the spring. There are also a pair of yellow violas that had the good sense to self-sow themselves right by the brick of the house. I believe they'll do alright through much of the winter because they'll be warmed by the radiant heat that comes off the brick of the south facing wall of the house. I check on them every time I go get the mail. Out in the back garden, there is some Vinca minor that has one or two blooms on it. Many gardeners will be horrified that I still have some Vinca minor growing in my garden, as it is considered invasive in many states, including Indiana. Relax. I am going to grub this out in the spring and toss it in the trash. And to think that in the late 1970's I worked in a nursery where this groundcover was grown and I actually helped to propagate it. Elsewhere in the garden, I am reminded that spring flowers lie just beneath the surface. Those leaf tips belong to Leucojum aestivum which goes by the common name Summer Snowflake. My bulbs were a gift from Leslie of Growing a Garden in Davis. It won't bloom until May so who knows why it is sprouting in fall. I'll blame it on the crazy weatehr. 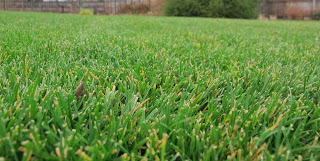 When I see my lawn these days, I am reminded that underneath that surface there are over 1,000 crocus bulbs waiting out the winter. I am also reminded by the green color that we really have not had much winter yet. My third, and final bloom is the only bloom I had last year. It is the Christmas Rose, Helleborus niger. This is the variety 'Josef Lemper' and it was sent to me last year by Skagit Gardens. I dearly love this flower and wonder why it took so long for me to figure out that it existed and I should have it in my garden to help fulfil the quote by Elizabeth Lawrence: "We can have flowers nearly every month of the year. It really is the only flower in my garden that is supposed to bloom in December. What about your garden? Are you snow covered or still enjoying outdoor blooms? Whatever your circumstances and however your garden looks during these December days, I hope you’ll join us for Garden Bloggers’ Bloom Day this month. It's easy to participate. 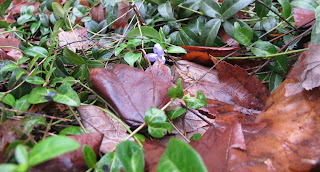 Just post on your blog about what is blooming in your garden on the 15th of the month and then leave a link in the ‘Mr. Linky’ widget below, plus a comment to give us a hint as to what we might find in your garden in December. Hello Carol, and thanks for hosting the GBBD again :-) I have lots of plants in flower in my London garden, zone 9, no snow yet but we have had frost for a week now. Happy GBBD! Hi Carol and a Happy GBBD! Your faithful viola is pretty, still hanging in there with the cold. 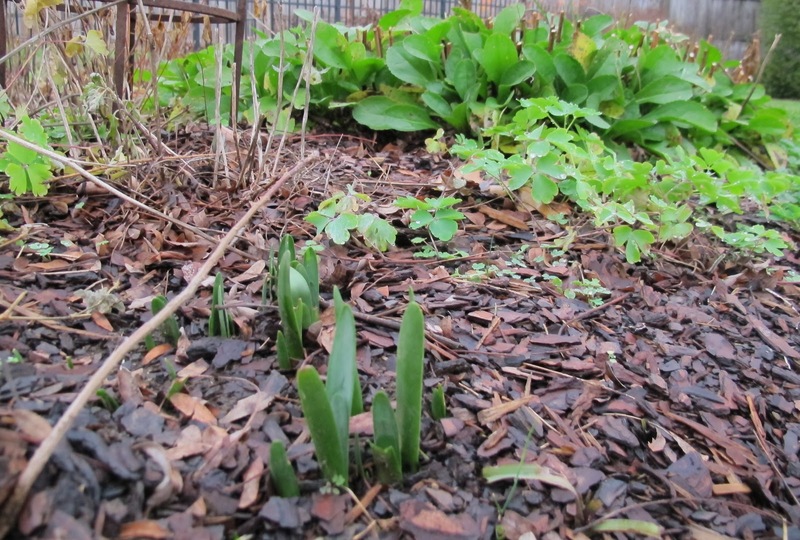 We haven't had any snow yet either here in zone 7 but there is a definite chill in the air and several frosts already. Love those cheery yellow violas, Carol, and the hellebore too. 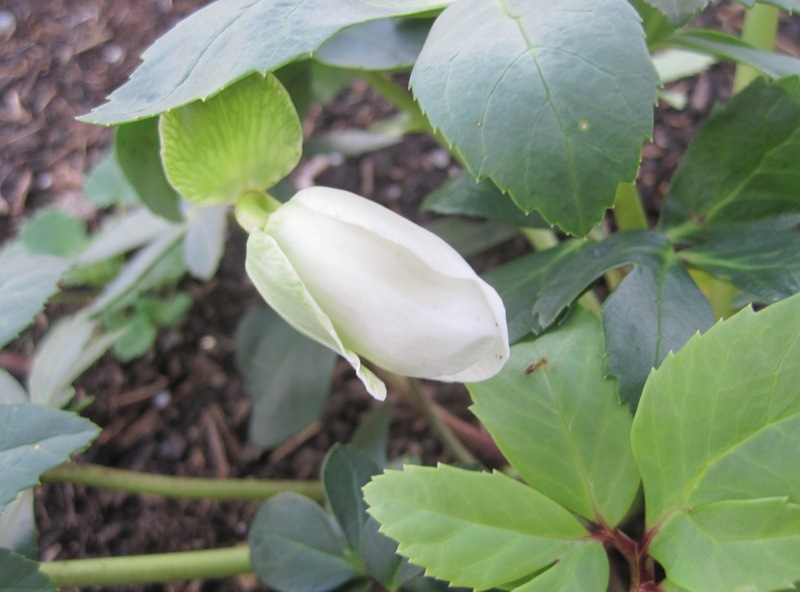 Our hellebore niger is budding - very exciting! It's three years old, and in previous years it's bloomed in spring. I'm happy to see it's doing its thing at the right time, and hope the bunnies don't eat the bud (just one) before it has a chance to bloom. Thank you once again for hosting bloom day. In my garden the roses are both marred and rejuvenated by our recent rain. The Clivia and Aloes are winter bloomers, but the Silene and Grevillea, like the roses, continue most of the year. Alas Violas do not hold up to my climate, so I very much enjoy seeing yours. Violas and pansies are my favorite, it's amusing because we can't grow them here, but the first time i saw it, it is my "spark" flower! 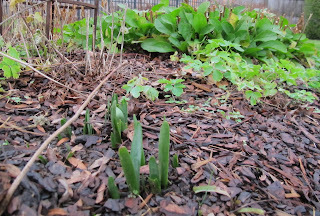 And since most of the garden bloggers are in their lowest because of winter, i will take the chance of showing ours, we still have a lot to show in December! And they are all still warm! Nice to see you have a Christmas rose in time for Christmas! Here we go with another midwest lack-a-winter. But the bloom I've got is NOT the one I want. Oops, my link above doesn't work. Here's a good one. Hi Carol - we've had days of hard frosts this week which have served to turn many of the flowers in my garden to mush. However, there's plenty of 'buds of hope' remaining, which is what I've chosen to talk about today. Happy Blooms Day everyone and I hope that there are 'buds of hope' to help heal the dreadful news we've heard from the USA this weekend. Happy GBBD Carol. Aren't violas wonderful? So delicate-looking and yet so tough. I really must get my hands on some Christmas roses, such lovely flowers, and they shine out in the dark days of winter brilliantly. No snow here and very decent weather, but few blooms besides the faithful roses and mums.So color comes from the wildlife in the garden. No blooms Carol but no snow either...just about 6 inches and some rain...rather dry and warmer than normal. 'Tis the time for hellebores and you have one. All I have is leaves. Wrong place I think. Love violas and you can eat them too! Happy Bloom Day. Thanks for hosting. Something a little different this month. I made a photo in a makeshift studio instead of scanning. Then did my usual manipulations. Have a great holiday. Looking forward to more GBBDs in 2013. Thanks again for sharing your garden of delights! Love the thoughtful time spent in the garden with only a camera! Happy GBBD from North Carolina! Anticipation, hope and survival are the whispers from the garden this time of year. Enjoy the article on Montrose! Happy Bloom Day, Carol and all Bloom Day Bloggers. The weather is pleasant in the Coastal South and there are blooms here, inside and out. This is my first Garden Bloggers' Bloom Day! Here in Ontario my gardening has moved indoors. I have a photo of a ravishing Christmas cactus to share. We don't have snow either and up until the last 3 days or so even nightime temps have not gone much below freezing. No violas here, though. It has been a very mild winter so far. I still have black & blue salvia and pineapple sage blooming. The winter hummers are grateful! I love violas and apparently they love my garden. I find them popping up all over in the lawn and back garden when they are planted in the front. Happy GBBD! Oh, it is cold here on Bloom Day. In the 20's and the most obvious bloom this morning is frost. Thanks, Carol, for another bloom day and for sharing your gardening enthusiasm all year long. Happy holidays! Marian S.
Thanks for hosting. I'm looking forward to see what everyone has on their sites. My post is not about blooms because we have none at present, so I hope you'll excuse a northerner for diverging a bit for the next few months until our humidity and temps allow us more excitement! Thanks for hosting. It is has turned mild agin in the UK after several days of frost and I still have a number of roses to share. 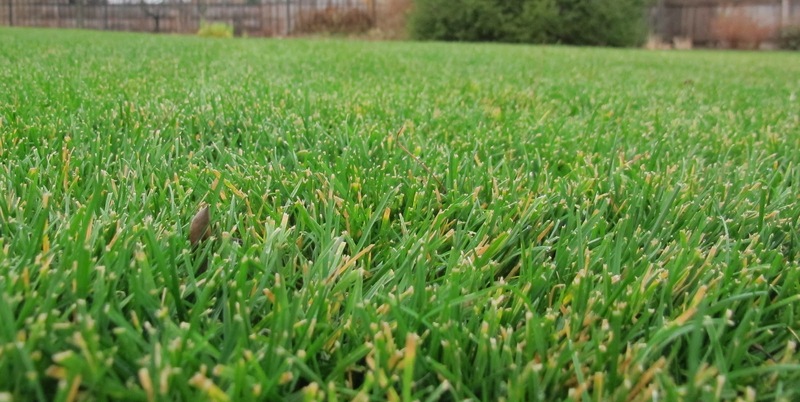 I look forward to seeing your field of crocus in bloom! Greetings Carol! Happy December Bloom Day and thanks for once again hosting the party! We've only had one real frost so far and it only clipped the tops of some of the large tropical plants but didn't seem to bother much of the stuff closer to the ground. Sounds like many of us are having a long autumn. Your violas are so sunny and sweet and your beautiful hellibore reminds me that I need to get a couple of the earlier blooming varieties! Hope you have a wonderful festive season! Happy Garden Bloggers Bloom Day. Thanks for hostessing. I have escaped snow too so far this winter Carol but we have had some bitterly cold weather for December. It's a shame that vinca is so vigorous - I have a pretty double blue one but ....... :) Your crocus lawn will be an absolute picture come spring. Thanks for hosting GBBD this year. Wishing you a Happy Christmas and good gardening in 2013. What an inspiration to see how many blooms are still around. My garden's looking miserable after deep frost and heavy rain. No blooms in sight, so I cheated a bit with one I took earlier this month. Hope that's OK. Thank you for the enjoyment of GBBD. The bud on your Christmas rose looks in much better shape than the bud on mine. My hellebore has seen too many nights in the teens without snow cover, I fear. No snow here, heck not even a frost yet (which is unusual)...I feel like I should have more blooming than I do! I also have the 'Josef Lemper' hellebore coming into bloom here in WDC-MD borderr zone 7. Love seeing late Fall/early Winter garden interest. Hi Carol and thanks for hosting GBBD. We thawed out just in time for the 15th as we were under ice and snow in this part of Scotland for nearly 2 weeks. It's not winter til it's winter in North Carolina...and even then it's not likely to be too cold. But the plants do go to sleep about now, so there's not a lot blooming outside at my house. The houseplants get a lot more exciting this time of year. I love your little yellow violas. Violas are so satisfactory to grow. There are acres of vinca in and around Charlotte. I haven't pulled out all of mine, either. Maybe this year. I love the Hellebores. We used to grow them in England...whites, yellow and a beautiful purple. We have quite a few blooms considering two freezes already this year. Happy GBBD everyone! Thanks Carol! It has been snowing all day at my house, but yesterday was our first real snowfall of the year. It seems winter is getting a slow start here, too. I really like your Christmas Rose. I will have to keep my eye out for one. Hello Carol, no snow here but quite a lot of rain and some blooms, too. I think we really can have flowers every month of the year here. This is my first time taking part in GBBD. Thanks for hosting and I’m looking forward to checking out all the inspirational blogs. Those violas and pansies are about as bulletproof as it gets. We're having an unusually warm winter so far too. The Christmas Rose is lovely. Amazing to think of hundreds of crocus bursting forth in the spring...and thanks for hosting Bloom Day! I have a bloom and much like you if I went looking I'da found some pansies and vinca, maybe even a late fall crocus, but I was busy. I don't have a December helleborus though. Maybe I need to fix that. I have also recommended and sold my share of Vinca minor. Thank you for hosting today, it is needed. Pansies are such happy flowers. Can't wait for the crocus! My hellebore has never bloomed, I'll have to live vicariously through you. Happy GBBD - thanks for hosting! Thanks for hosting Bloom Day Carol. December is always a challenge, but Helleborus usually comes through! We have yet to have the first freeze, so there are still scattered blooms from the roses and other summer flowers. My brugmansia are in full bloom. And the camellias and cyclamen are just beginning to come into bloom. 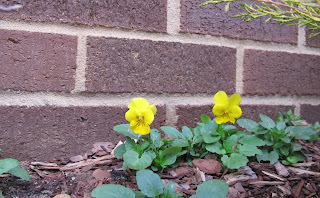 Your Violas are cute, Carol, I usually don't have the nerve to get some until nearly spring for baskets, though they are supposed to be winter-hardy here most of the time. I have a surprise overblown Camellia finally blooming, a magificent rose still trying to pump them out, and a few bright cheery houseplants. I joined in this month and I look forward to visiting other sites. I agree with your observation that there are more blooms than last. I am very worried that my garden will take a real blow when the first real cold snap comes. Thank you for hosting, Carol! My Mahonia 'Arthur Menzies' is the star in my garden right now. I confess I had to move things indoors for this posting. Nothing remains outside these days in my neck of the north! I so happy to find a friend of mine here for the first time! I'm new to this GBBD thing - and to garden blogging in general. I absolutely adore your blog (yes, I'm a lurker!) and am thrilled to have started my very own little patch in the garden blog world. Thanks for hosting and I look forward to making some new Garden Friends!! I am working on the premise of better late than never so here is my bloom day post. I, too, am joining in late. How fun that you have three blooms - although next year you won't have vinca minor to show off! I'm very late posting but so glad to finally join in! Among my limited blooms, I have a sasanqua camellia, and a reliable rosemary for December. Thank you for hosting, Carol! Well, my GBBD has all kinds of stuff in it; About my grandma, her garden, and how she single handedly got me into growing orchids, the wonderful news that the Royal Melbourne Botanic Gardens has for everyone, very exciting indeed, and quite a confusion concerning the identity of one of our new Roses. I am very, very late with my Bloom Day post, but didn't want the month to go by without joining in!